Diversified Trading Institute (“DTI”), was founded in 1996 by Tom Busby, a professional securities trader and broker since the late 1970’s. Tom started with Merrill Lynch in 1980 and in 1984 became Vice President of Smith Barney. Tom has traded the S&P 500 and NASDAQ futures since their inception and was uniquely selected by the European Eurex exchange to travel around the U.S. to introduce trading the German DAX Index to high-net-worth individuals. Quoted and published in Futures magazine and Active Trader magazine, Tom actively trades and invests in stocks, options, futures and currencies. Guest appearances include CNN, First Business News, MoneyShow.com and Steve Crowley’s American Scene Radio. Recognized as one of the first educators to trade live in front of an audience, Tom authored Winning the Day Trading Game, Trade to Win, and The Markets Never Sleep. The DTI Method can be utilized to analyze or trade any market, whether you are interest in learning stocks, options, futures, currencies, commodities or even cryptocurrencies. 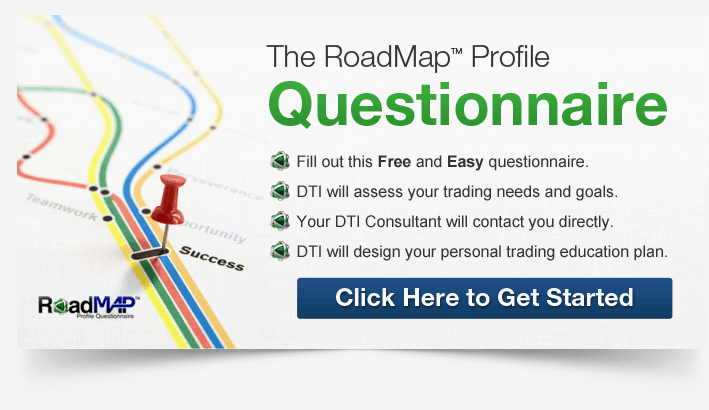 By joining the DTI family of students, we believe you will receive a truly diversified trading education. We have taught thousands of students over the years and can put together a personalized education plan to help you reach your trading goals. Get started by filling out the Roadmap Profile Questionnaire. The reality is that many traders do not realize we all live in a truly 24-hour “global” market. The markets essentially never sleep as they are traded around the world each day. Before the U.S. Market opens, Asia has already finished their day and the European Market is winding down. This means that what happens during the actual U.S. trading day is just a small part of the overall trading picture. Traders who do not realize the importance of the 24-hour global market put themselves at a distinct disadvantage. To maximize putting the odds in your favor, we believe it is essential to teach our students how to analyze the 24-hour market. 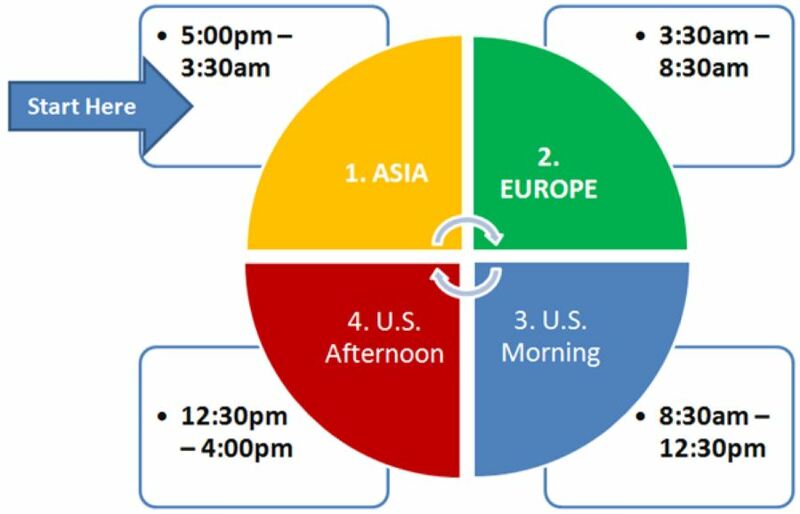 The DTI Method divides the market into 4 major time segments: Asia, Europe, U.S. Morning and U.S. Afternoon (see illustration below). The featured market within each time segment holds a primary influence on the markets. This means that any major news coming out of Europe will often times have a direct affect to where the U.S. market will open later that day. Timing is everything when trading the markets. Buying and selling the stock of even the most fundamentally strong company at the wrong time can be a costly mistake. We also understand that patience is sometimes vital to a trader’s success. Herein is the dual meaning of the word time. Both are equally as important to the short-term and swing trader. That is why Time is the first component of the DTI Method. We teach students intraday trading by recognizing the best Times of Day to trade the 24-hour global market and we teach students how to recognize the “big picture” trend in the markets so they can formulate their long-term strategy accordingly. Understanding Key Numbers such as Opens, Pivots, Support and Resistance holds great importance in identifying where a market has been and where it may go next. Many traders are familiar with market generated support and resistance levels that develop due to everyday buying and selling taking place in the market. But did you know there are historical support and resistance levels as well? Over his 40 years of trading the markets, Tom Busby has identified other important support and resistance levels that tend to hold importance. At DTI, we call these “historical” key numbers. By combining our method and powerful RoadMap™ market analytical software, we can teach you about trading whatever markets interest you in the U.S. or abroad regardless of where you live in the world.